Installing a Velux window can add lots of lovely natural light into your home. They help make the best of any good views and add kerb appeal to your property. Velux windows are often added into loft extensions, home renovations and single storey side or garage extensions. 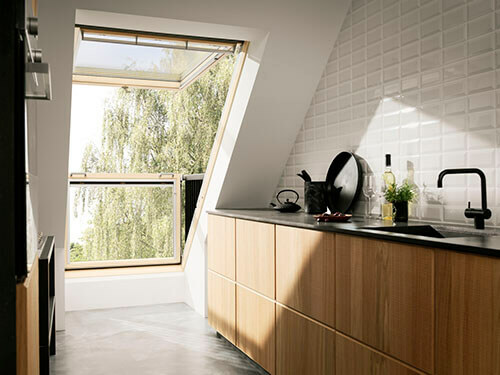 If you are adding a Velux window into a loft for added brightness, that will be for occasional use only, the window can be placed in whatever position is most suitable, providing it doesn't weaken the roof structure at all. However, if the loft is going to be converted to be habitable ie bedrooms or bathrooms, each room will need its own window. Some Velux windows will require planning permission depending on their size or where they will be situated, so it's best to check with your local council. 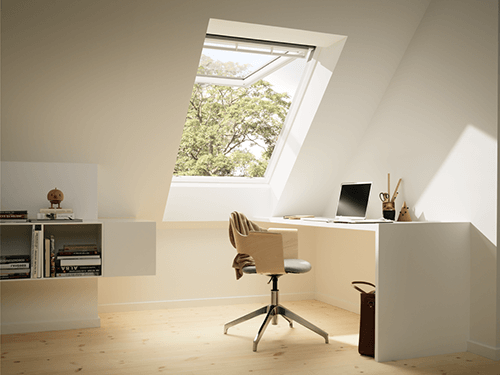 Adding a Velux window can be a tricky procedure and you will probably be working at a height, which adds safety issues, so seek advice or help if need be. 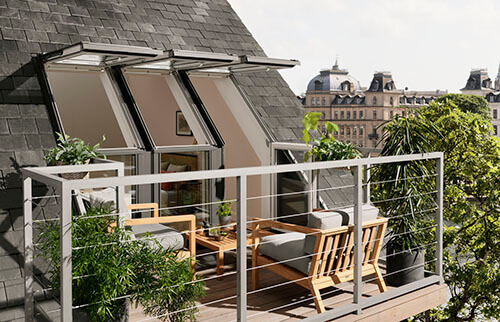 It is possible to install a Velux window entirely from inside the roof space, but it is as well to check you can get at the outside of the roof easily, just in case a tile escaped (check no one will be walking beneath where you are working just in case). Things you will need:- tape measure, pencil, ladder, hammer, screwdriver, knife, pincers, saw, spirit level, safety goggles, gloves and the manufacturer's instructions with any additional equipment or parts they recommend. How you begin your installation depends on whether you are installing your Velux window into an existing roof or into a new roof as it is built. Installing a Velux window into an existing roof:- Firstly start by measuring and working out where the window will go on the rafters inside the roof space. Mark out the centre of the window space, (care may be needed whilst working in the loft space depending on whether the loft has a boarded floor or not). Next, remove the roofing felt and battens from the middle of the area marked out, and then remove the roof tiles and cut the rafters away to leave a clear opening for the new Velux window. The opening will need to be around 40 to 60mm larger than the window to be fitted. You will now need to measure the opening to ensure it is square and true, using a spirit level to ensure all edges are straight. Fix new top and bottom battens back on to strengthen the edges, checking again with the spirit level. Velux windows are available with an insulation collar to ensure a secure well-insulated window. Clip the corners together to construct the collar and then pass it into the loft ready to use. Next, separate the window frame from the rest of the window (the moving sash part) and locate the brackets, these brackets need to be screwed into the window frame. Then lift the window frame into the opening and then screw the brackets into the window batten and into the rafters to make the bottom of the window frame secure. Next, reattach the window to the window frame by lining up the hinged parts of the sash to the slots on the window frame, these should line up easily. Then open the sash and check everything is lined up correctly, you may need to adjust if the gaps are uneven. Once the window is all lined up evenly, screw the top brackets into the batten and rafters, your window should now be secure. Around the window you will need to add an underfelt collar, this is to allow for any rainwater running past the roofing felt and helps to ensure the window is watertight and minimise condensation. At the top of the window, you will need a gutter, the underfelt collar will need to be folded into the gutter and then secured with clips that came with the gutter and underfelt kit. You will then need to replace the tiles under the window and then they will need flashing installed over the top of them. Velux makes flashings for many different types of roof surface materials so select the correct type for your roof surface. You need to smooth and push the flashing down over the tiles and screw it into place. This also helps protect the roof and window from the weather. Finally, you need to replace any tiles from the sides of the window, you will probably find the tiles will need cutting to fit. An angle grinder will be needed to do the tile cutting and leave the window looking neat and tidy. Inside the roof space, you will need to tidy up the edges of the roof's vapour barrier so that no moisture gets into the roof. If the Velux window is to be fitted to a brand new roof then, as the builders fit the rafters, space can be left in readiness for the window. Then when the roofing felt and battens are put in place the window gap would be left open and the Velux window can then be installed. The advantage to this is that the window space can be measured accurately and the window fitted before the roof tiles are in place, meaning it can be tiled around easily. Otherwise, the procedure is exactly the same as for an existing roof.